Yes, Chaos Publishing was there and what a great event it was! Over the many years that we have attended the Expo it has gone from strength to strength and this year was no exception. The Hilton Hotel still held much of the Expo’s many and varied activities, the role-playing and other participation games, open gaming, play test zones, food court, and way too much more to list here. This year, for the first time, saw a separate trade hall that housed all of the exhibitors’ stands. This year’s Expo took place over three full days, Friday, Saturday and Sunday, three whole days of gaming to feed your geek! Bliss! Situated in the NEC hall 1, a stones throw from the Hilton, the trade hall was gigantic. The extra space allowed for wider corridors and even though the footfall was expected to be much, much higher than before, it was so still much easier to wander around. The hall was light, airy and cool, which was great because the Expo enjoyed some proper summer weather, with blue skies and lashings of sunshine. As all of the exhibitors were in one place, and not spread about throughout the Hilton, it was much simpler to find the particular stands you just had to get to. The walkways even had street names emblazoned on them based on a stand that was to be found on that thoroughfare. Chaos Publishing was very privileged to be able to share a stand with Mage Company and what a lovely stand Mage had put together. 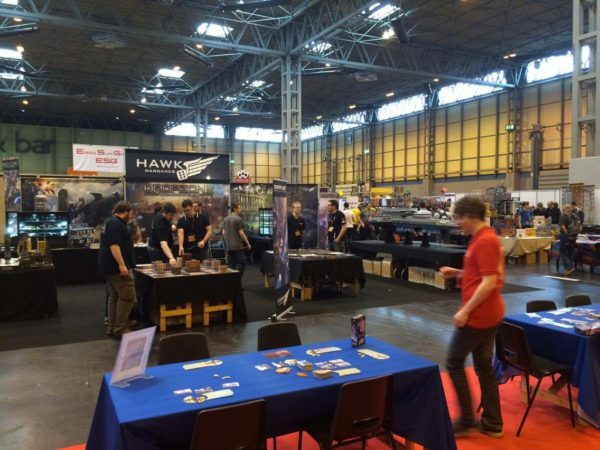 A large carpeted area fronted by a long counter with all the games for sale displayed along it and a really big gaming area with 16 tables for people to test out both Mage company’s and our own games. Even the colours of the carpet and tablecloths complimented each other, it looked lovely. We demonstrated Res Publica 2230AD, a new game that Chaos co-published with Mage Co., alongside Medieval Mastery and my! were we busy! Res-Publica 2230AD, ready to go! Setup was on Thursday this year because of the extra full day of trading. The hall opened at twelve and exhibitors were actually able to drive right in to unpack and set up. Although there was somewhat of a queue to access the hall at first, it was still a huge improvement on previous years. It was fabulous to meet all the guys and girls from Mage Co. and of course to meet Alex face to face for the first time. What a lovely bunch they all are, we had loads of fun working alongside them for the Expo and hopefully we’ve made some new friends too. After unpacking and setting up the counter and demo tables we moved the car over to the hotel car park, booked Miles into the Hilton and headed off with our friend, Richard Scarsbrook of Chance and Counters games cafe in Bristol, to meet another friend, Andy Hopwood of Hopwood Games, and get some serious play testing in. Massive coffees were required and so some truly gigantic lattes were acquired from Costa, fantastic! Andy’s game was so good we lost track of time, those of us heading home overnight got there damn late! The atrocious roadworks on the M5 didn’t help and in fact were a nightmare the whole weekend. By Saturday night the longer cross-country route was decided on as a must do alternative. On came the Expo proper. Miles covered the Press coverage and the opening, with the much appreciated assistance of Richard who stepped in to help out while David and Martin sat in traffic cursing and moaning. They eventually arrived to pitch straight in and give Miles and Richard a break for them to take in the ambience and to meet up with some of our games publishing compadres that were also exhibiting at the Expo this year. Friday seemed busy enough with hoards of people making their way around the stands, many stopping to try out our games. However, in retrospect, Friday was actually relatively quiet. Saturday and Sunday were packed! It just goes to show how the gaming community has expanded over the last few years. 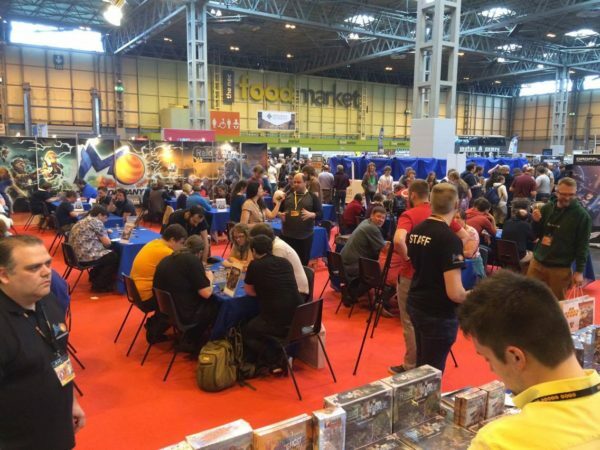 Board games cafes seem to be springing up all over the place and many established games centres such as Firestorm games in Cardiff and Manaleak have moved to new, larger and nicer locations. All this seems to have driven the gaming industry along to make it what it is today, thriving. So, on to Saturday and Sunday. Mark and Geli very kindly came along to help out both days, which was super of them and their help was really needed. Both days were a bustle of demoing and playing, even though actually sitting and playing a game when you’re needed to make up numbers takes a little while, it’s just so much fun to laugh your way though a game now and again, it’s as good as taking a break. Board games are great and that’s why we decided to make them! The hours flew past on Saturday and before you knew it the trade hall was closing for the day. Then it was a mass migration over to the Hilton to take advantage of the excellent food court and more Role playing, mingling and board gaming until the small hours. Sunday was just as busy, the Mage Co. stand was full again most of the day, only quieting slightly about half an hour before the Expo sadly had to a to come to a close for another year. The whole thing passed way too quickly as it always seems to do, but was such a fantastic experience. The new exhibitors’ venue in Hall 1 was excellent, well supported by vendors and had plenty of places to sit and relax. It’s close proximity to the Hilton didn’t detract at all from the convention, in fact, if anything, the delineation between the exhibition itself in the hall and gaming based at the Hilton seemed to enhance the whole. You kind of knew where you were and what you were doing there, much less confusing than having to figure out what was where and how to get there when it was all based at the Hilton alone. So, in closing, a huge thank you to Mage Co. for having us join them and a big shout out to all our friends that help to make the board games community as great as it is. Fantastic to see you all at the Expo this year folks! We will definitely be back again next year and we hope to see you there too!